This time of year always has me in a mood to declutter. Even though my family had a pretty minimalistic Christmas, at least compared to some years in the past, I still feel the need to declutter my home now that the holidays are over. I think this urge to purge is pretty normal during this time of the year and it’s mostly attributed to the accumulation of more stuff thanks to Christmas gifts. Not only that, but the whole “new year, new you” thing has many people in the mode to clean out old stuff to create a new energy for the new year. If you are on a decluttering kick, here are four easy ways you can cut down on clutter in your own. I used to feel guilty when I got a gift I didn’t want or need and I felt the urge to return it. Now I know that I’m not the only one who does this. I haven’t gotten too many gifts over the past few years that were duds, but when it does happen I no longer feel guilty about returning, or even re-gifting, things I don’t want or need. The one in, one out rule is a good one to live by if you are satisfied with the amount of “stuff” you currently own. With this rule you get rid of one item for every new item you bring into your home. For example, if you got a new sweater for Christmas, then you need to get rid of one you already owned. Sometimes this rule isn’t used to get rid of a like item. Instead, some people choose to be a little more loose with it. Instead of getting rid of a sweater to make room for a new one, you could instead get rid of a book or a kitchen utensil. With a little alteration, this rule can also be altered to help you cut down on the number of things you own. 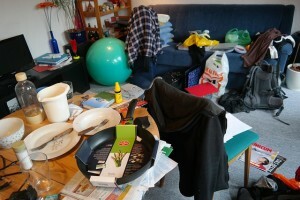 If you think you own too much stuff, try getting rid of two items for every one item you bring into your home. Another easy way to get started with decluttering your home is to start small. Set a timer for 10, 15 or 20 minutes and work on tackling clutter until the timer goes off. If you repeat this task every day in the same area or room, you’ll have that area clutter free before you know it. Then you can move on to a new space. If you don’t like the idea of working on decluttering for 20 minutes at a time, you can choose to declutter you home by getting rid of one item each day. This method is a smart way to de-clutter if you are prone to being too hasty with your decluttering and wishing you hadn’t gotten rid of something. Because you only get rid of one item of clutter each day, you’ll have plenty of time to think about those things that are more difficult to part with. This time of year is the perfect time to declutter your home. In fact, decluttering and organizing your home now may mean more money for you in the future if you hold a garage sale to sell your clutter this spring or summer. Are you in the mood to declutter? How do you cut down on clutter in your home? Have you used any of these methods? Try the One In, One Out Rule seems a good strategy. I badly need to declutter because my house seems to have full of gifts for my children. I think I gotta use this to properly get those things out my house and to declutter. The one in, one out rule really helps me from adding more clutter to my house.